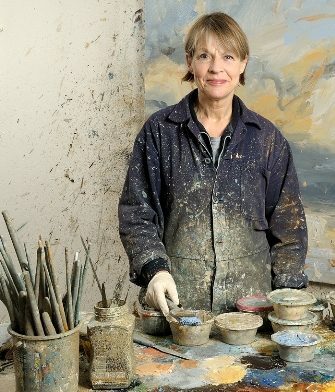 Louise Balaam is a painter of expressive, gestural landscapes. Her paintings communicate an intense emotional response to the experience of being in the landscape. The materiality and sensual qualities of oil paint are important elements of Louise’s process. “I love the way paint is simultaneously itself, essentially coloured mud, while also somehow evoking the space and light of the landscape. For me, the light is a crucial aspect of the emotional impact of the painting. I’m fascinated by the mysterious way paint expresses things which can’t be put into words.” She is influenced by the English landscape tradition, particularly Constable: “Painting is but another word for feeling.” Other important influences include Joan Eardley and Peter Lanyon, as well as American abstract expressionist artists Willem de Kooning and Joan Mitchell. Louise’s work is also informed by writing about the natural world, particularly Nan Shepherd, Robert McFarlane and Rebecca Solnit. Drawings made in the landscape are used in the studio as starting points for a way of painting which is exploratory and intuitive – the painting develops through an almost unconscious process. Louise Balaam is a member of the New English Art Club (NEAC) and of the Royal West of England Academy (RWA), and has a degree and a Masters qualification in Fine Art. She has work in many private collections and has shown in the Royal Academy Summer Show, the Threadneedle Prize, the Lynn Painter-Stainer Prize, and the Discerning Eye. Louise occasionally teaches classes and workshops, which you can find out about in News and Events.